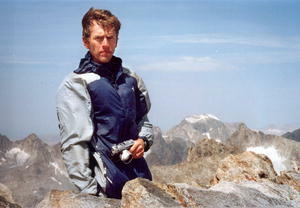 " It was an honor to add our names as two hometown boys who had started this climb just 8 ½ hours ago. Little did I know at the time - the easiest half of the trip was over." Other climbers were coming into sight and the top seemed to be getting a little closer with every step, just as Hank had promised. As we neared one of the climbers it appeared to be safer to climb off to the side rather than straight up behind because of the loose rocks. My seasoned climbing partner wasted no time in picking a long slick rock for the final ascent. 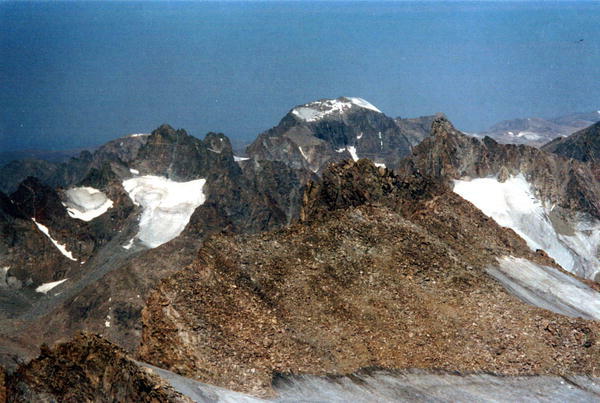 When you look at Fremont Peak from a distance you would think that the exact top would be hard to determine but that is not the case as we reached the third highest point in Wyoming. There at the summit was the most magnificent view you could ever imagine and there is no mistaking where the exact top is. 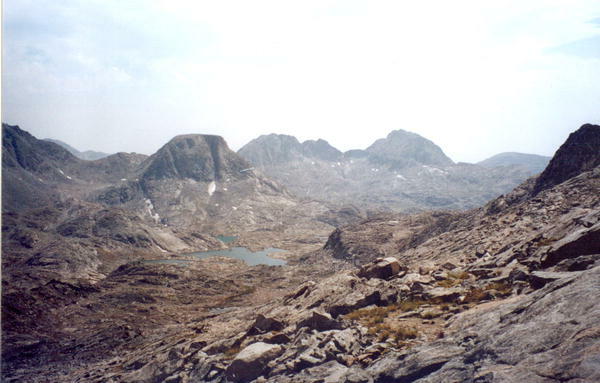 Looking off the back side at the vast glaciers and mountain tops is a memory I will never forget and then to look to the west and see Gannett Peak towering above all else, was unbelievable. Another thing that really humbles a person was the fact that there were five other climbers at the peak at that exact moment and two of the gentlemen were in their mid 60's, a true achievement in anyone's book. The wind was blowing pretty good and as refreshing as it felt when we first arrived it did not take long to start cooling off. As Hank and I hunkered down to eat a victory sandwich we added our mark to the many climbers who had conquered this same peak. Name after name was entered on the recording sheet that was sealed up in an old ammunition case and placed in the rocks and it was an honor to add our names as two hometown boys who had started this climb just 8 ½ hours ago. Little did I know at the time - the easiest half of the trip was over. One final picture of the boys on top of the world and it was down the mountain before dark. It was at this point that all the blisters in the world began to let themselves be known on the bottom of my feet. I stopped several times to adjust my shoes and tighten the laces but to no avail. 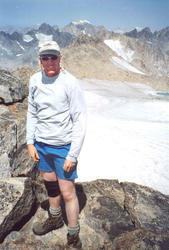 As I benched out above Titcomb Basin where several of the other climbers had stopped to rest, I had to air out my feet. Hank was wiser and had taken more time coming off the steep grade and I guess I let it get to my head that for the first time in the whole trip I was ahead even though it was going downhill. The other climbers were talking of their day's adventure and could not believe that we had left from Elkhart Park that morning. They were very interested in the details of our adventure and encouraged us, wishing us a safe trip as we pulled our shoes on and headed back for Indian Basin. As I mentioned earlier there really are no trails and you just kind of wander your way through the rocks and sparse patches of grass. Although the traveling was easier than the steep face of Fremont the trip as a whole was starting to show some wear and tear. When I reached the basin where the pond sits I could not get my shoes off fast enough. The cold mountain water was the best relief all day on my feet. Hank and I gazed back up our route as I soaked my feet. The only thing that would have made this day any better at this point was to see a helicopter come over the horizon and give us a lift back to the truck. But then again I guess that would have defeated the big part of the trip and I am sure Hank would not have ridden it anyway. Speaking of Hank, he was off again so I pulled my boots back on and fell in line. I was not taking in the scenery quite as much at this point and really don't remember a lot about the trip until we reached a good stopping point just south of Island Lake. As we sat down for a snack some backpackers were coming up the trail and as they neared we recognized them as four Pinedale High School senior girls heading to climb Fremont as well. They were going to base out of Island and head for the summit first thing in the morning. All of this just reminded me of how fortunate we are to live and raise our children here in Pinedale, Wyoming. We have so many opportunities to enjoy and share with our kids and it was really good to see these young ladies all packed up and sharing that time together. We wished each other luck and hit the trail again. The trip out was definitely busier than the trip in as we passed several sets of backpackers, outfitters, and even a group with llamas. At this point I think I would even have ridden one of those hairy critters if it had been offered to me even though it is strongly against my nature (anyone who knows me at all can attest to my true lack of compassion for anything that spits at a guy). Since the opportunity did not present itself, I trekked on and by sunset I was nearing Photographer's Point. What a trip it had been. To my surprise Hank had even stopped to rest and let me catch up and it was really neat to sit and take in the horizon as the daylight slowly faded away. I gathered up my handful of clothes that I'd hidden behind the trees and psyched myself up for our final leg. Every step seemed to get harder and harder and at this point I came to grips that this trip was no longer a physical challenge. This last push was going to be completely mental and like I tell my son, we were beginning to separate the men from the boys. Hank faded away in the distance and I was beginning to feel a whole lot like a boy. But just wait, boys can make this trip too and at 8:45 p.m. I gimped into the parking lot at Elkhart Park and met up with Hank for a congratulatory hand shake and a sigh of relief. This was the second trip with Hank about 10 years apart from each other and nothing was different. The company and trip are both experiences I will never forget but they are both trips that I care to never experience again. The next trip may be in the mountains or on the meadows but rest assured it will at least be "off the paved road"!